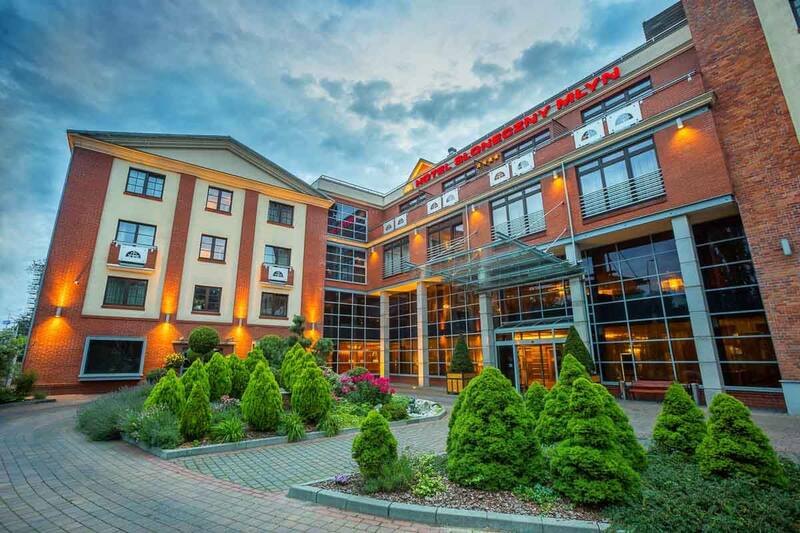 The Słoneczny Młyn is the first 4-star hotel in the city located on the Brda River in Bydgoszcz. The building is the adaptation of the 19th-century Kentzer Mill. The interior decor refers to the trends characteristic in the early 20th century with Art Nouveau and Art Deco elements. Individual floors of the hotel reflect the atmosphere of the four seasons of the year: spring, summer, autumn and winter. The Słoneczny Młyn Hotel was founded on the place once occupied by the Kentzer Mill, located on 96 Jagiellońska Street in Bydgoszcz (former 36 Promenada Street). The mill was built in 1862 by two partners, Ludwik Wolfen and Meyer Fliess. Due to its low power and employment, the mill had operated only until 1890. In 1892, the mill was taken over by the partnership of Willi and Moritz Baerwald. The initial works included reconstruction and modernization; the facility was practically built from scratch..
After the rebuilding, the capability of the mill increased to 20 tons of rye and wheat milling per day with employment amounting to 14-15 people. In 1898, some works had become automated, resulting in production increase to 30 tons of rye and wheat milling per day. The company constructed a narrow-gauge railway, running from the mill to the pier on the Brda River, in which barges had been loaded and unloaded. The Baerwald Mill was a steam-powered mill, the most advanced facility of this type in Bydgoszcz. The mill was also provided with a grain elevator and granary, which had conditions for safe storage of grains. In 1938, the mill was purchased by Bronisław Kentzer, a resident of Bydgoszcz. He had been running it until 1939. Starting from 1940, the mill had operated under the management of Gustaw Harmel of Germany until 1945. After the war, the mill was taken over by the Społem Cooperative, returning for a brief period to Jan Kentzer. In 1948 the mill was nationalized, falling into disrepair.